The 32-Inch, Sony KE-32TS2 is considered a baby amongst other plasma televisions on todays market. The theory is, what you loose in size, you gain in quality. Well, let’s put that theory to the test. One of the best things about smaller televisions is that they usually have smaller pixels. 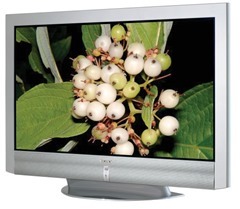 The KE-32TS2 is no exception with a resolution of 852 x 1024 which exceeds many 42-Inch plasma displays. You’ll also find on the spec sheet that the KE-32TS2 has 1000:1 contrast ratio, but unfortunately there have been a few complaints about the blacks not being deep enough. There is another problem where the letterbox lines (black bars on the top and bottom of the picture) appear dark grey rather than black. You’ll find the Sony KE-32TS2 is a bit feature limited. It doesn’t have dual-tuners or a memory card slot, and it doesn’t seem to feature many image enhancing technologies. A little disappointing when you consider the price of this plasma. It does however have stereo speakers and a pedestal so it would make a great bedroom television. Let’s not forget the image quality of this television though, the Sony KE-32TS2 generates some of the best looking images, so if you are fussy about your image quality, you can be assured that this little beauty won’t let you down. In conclusion, this television is great for those who want something with excellent image quality. The price is a little high but if that’s not a problem, go for it.